Reconstructing mandibular defects after trauma or ablative surgery is reliably done with compressed autogenous cortical and cancellous particulate bone. We present the use of a demineralised allogenic humerus shaft as a conduit for the autogenous particulate bone. This technique simplifies surgery, is less morbid for the patient, the graft also resembles the remaining native mandible and reduces overall treatment cost for such patients. The reconstruction of the human mandible after ablative surgery presents several challenges. Perhaps one of the more challenging aspects is the choice of preferred reconstruction technique. The work being done in the field of tissue engineering shows great promise, but a reliable and reproducible engineered graft for mandibular defects has to date not materialized . Many surgeons favour a free vascularised fibula graft whilst others, an autogenous non vascularised graft. Our preference for small to moderate defects after benign neoplastic tumour resection, remains the latter. Autogenous compressed particulate cortical cancellous bone (PCBM) harvested from the anterior ilium is our technique of choice. Containing this type of graft in the resection bed is problematic as it tends to disperse and lose its intended form . The use of an allogenic carrier is well documented in the literature, with split rib, fibula and mandible being well documented . We believe that the use of an allogenic demineralised humerus (ADH) is desirable, and that its in vivo use as a conduit for PCBM is not widely reported in the literature. Patients that have undergone partial mandibular resection for benign neoplastic pathology, were candidates for reconstruction using a combined ADH conduit with PCBM. The ADH shafts were provided by BONE SA (Bramley, Johannesburg, South Africa); comprising two lengths, namely 10 cm for unilateral reconstruction and 20 cm for larger defects that include the symphysis. The ADH shafts are quality controlled then given a 10% hydrochloric (HCl) acid bath, neutralised with a 0.1% sodium bicarbonate (NaHCO3) solution and rinsed in sterile water before being packaged (Figure 1). The ADH has a recommended shelf life of two years and requires refrigeration. The ADH shaft is hollowed out to a cortical thickness of about 3 mm and then perforated multiple times with a round burr, all the while being kept moistened with Lactated Ringer's solution (Figure 2). The ADH shaft is then filled like a sausage with PCBM, harvested from the anterior ilium (Figure 3) and this allogenic autogenous composite bone conduit is grafted into the defect site (Figure 4). The conduit was grafted immediately after resection, making this a single staged surgery with no need for interim spacer . The allogenic humerus is provided by BONE SA (Bramley, Johannesburg, South Africa) a bio-medical company that acquires its tissue from donors. The humeral shafts are used in orthopaedic applications where they are grafted as spinal struts, and is this an existing product in their range. Allogenic humerus takes two weeks to prepare, and once packaged may be stored for up to 2 years in Refrigerator, which means that cases may be planned on a whim. This bone in non-immunogenic and carries no risk for transmission of infectious disease as it is Gamma irradiated (25 kGy) further, all donors are tested for HIV; Syphilis; Tuberculosis and Hepatitis B & C. A demineralised humerus has dimensions that mimic the mandible in its height and width. The ADH is pliable and hence may be bent and moulded along the natural curvature of a mandible. It also contains the PCBM preventing displacement and reducing the required volume. The semi-rigid, shape and volume, prevents tethering down of the soft tissue and this results in a widened crest for future dental implant placement. The use of circumferential wire around the ADH and reconstruction plate, allows for close adaptation between the plate and the graft. Perhaps the most persuasive reason for the use of ADH is that it is osteoconductive, but the demineralisation exposes some osteoinductive bone proteins too . There is no appreciable cost increase with the use of the ADH; 10 cm length (USD 140) and 20 cm (USD 280). In our opinion, the use of an ADH shaft as a reconstruction conduit to carry PCBM may be exploited to the benefit of patients, as it simplifies the reconstruction of the mandible. The technique saves time intra-operatively, and results in a reconstruction that closely resembles the remaining native mandibular bone. No funding of any nature was received. Meijer GJ, de Bruijn JD, Koole R, van Blitterswijk CA (2008) Cell based tissue engineering in jaw defects. Biomaterials 29: 3053-3061. Ferreti C, Muthray E, Rikhotso E, Ryneke J, Ripamonti U (2016) Reconstruction of 56 mandibular defects with autologous compressed particulate corticocancellous bone grafts. Br J Oral Maxillofac Surg 54: 322-326. Marx RE (2012) Maxillofacial Reconstruction Using Cancellous Cellular Marrow Grafts. In: Bagheri SC, Bell RB, Khan HA. 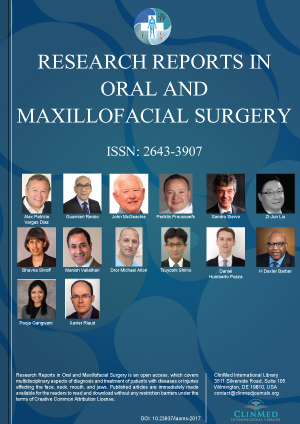 Current therapy in oral and maxillofacial surgery. Elsevier, Missouri, 545-557. Ferretti C, Rikhotso E, Muthhray E, Reyneke J (2013) Interim reconstruction and space maintenance of mandibular continuity defects preceding definitive osseous reconstruction. Br J Oral Maxillofac Surg 51: 319-325. Toricelli P, Fini M, Giaveresi G, Giardino R (1998) In vitro osteoinduction of demineralized bone. Artif Cells Blood Substit Immobil Biotechnol 26: 309-315. Jameel Desai, Consultant and Senior Lecturer, Department of Maxillofacial and Oral Surgery, University of Pretoria, Gauteng, Postnet Suite 293, Private Bag X23, Gallo Manor, 2052, South Africa, Tel: +27-823-379-976. © 2018 Desai J, et al. This is an open-access article distributed under the terms of the Creative Commons Attribution License, which permits unrestricted use, distribution, and reproduction in any medium, provided the original author and source are credited.